Comet PanSTARRS glows with a fanlike tail in this picture from Argentine astrophotographer Ignacio Diaz Bobillo. The first of two comets expected to make a splash this year is already putting on a good show for Southern Hemisphere skywatchers — and by the time it makes its appearance in northern skies, Comet PanSTARRS should be visible to the naked eye. C/2011 L4 PanSTARRS, which was discovered in 2011 by the Pan-STARRS telescope in Hawaii, isn't expected to be as much of a spectacle as Comet ISON, which could get as bright as the full moon in November. But it's on track to reach a brightness of at least magnitude 2 in early March. That's roughly equivalent to the brightness of Polaris, the North Star. "This comet definitely is a dynamically new comet, so we do have the wild-card factor in there," Karl Battams of the Naval Research Laboratory told NBC News in an email. "In an ordinary year, this comet would be grabbing the headlines, but most people are so worked up over ISON that this one is getting short-changed a little. It should be a good one though. ... For us urban dwellers, we might need to dust off the binoculars to get a decent look." Battams and other astronomers say PanSTARRS is a special case because it's apparently coming in from the Oort Cloud on the solar system's edge to make its first swing through the inner solar system. That's what makes PanSTARRS a wild card: There's a chance that the comet will get brighter than expected, or stay dimmer than expected, when it wheels around the sun. "Comets do love to surprise us," Battams said. Right now, the comet is on display only in the Southern Hemisphere, but bright enough to be seen with the naked eye under optimal conditions (as bright as magnitude 4.2). Pictures taken through telescopes, such as the shots you see here from Pampaskies.com's Ignacio Diaz Bobillo in Argentina and amateur astronomer Terry Lovejoy in Australia, are already showing a fanlike double tail. One of the tails is a stream of dust illuminated by the sun, while the other is a glowing stream of ionized gas. An image captured by Australian amateur astronomer Terry Lovejoy shows Comet PanSTARRS. 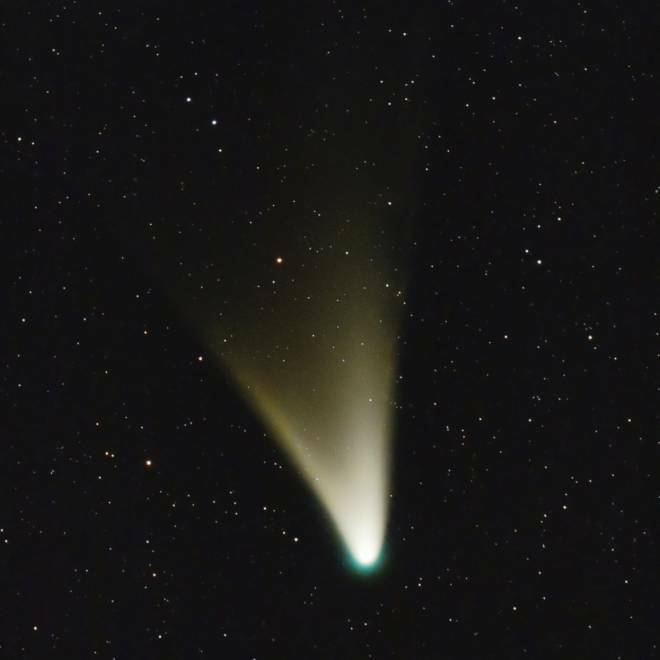 This NASA Science video shows you where to look for Comet PanSTARRS. PanSTARRS should start showing up in the Northern Hemisphere around March 7. "To see it, you will need an unobstructed, cloudless view of the western horizon," the University of Hawaii's Institute for Astronomy said. "It is best to pick a dark spot, away from streetlights. Look in the direction of the sunset just after the sun has gone down. The comet will be just above the horizon." "By the end of March, the comet will no longer be visible in the evening sky, but if you get up early, you may be able to see it in the eastern sky just before sunrise," the institute said. "However, by then the comet will be farther from both the sun and Earth, and will therefore be fainter." When PanSTARRS fades, keep your binoculars in a handy place. You'll want to bring them out again for this year's other sky highlights, including the advent of Comet ISON in November. Comets Lemmon and PanSTARRS sweeping through the Southern Skies from Alex Cherney on Vimeo. Watch in full-screen HD for best results. Hat tip to Daniel Fischer.